Preheat oven to 375 degrees. In a bowl, drizzle carrots with 2 tablespoons of the olive oil and sprinkle with the cumin, paprika, salt and pepper. Using your hands, toss the carrots to evenly distribute the spices onto each. Transfer carrots to a parchment-lined baking sheet. Sprinkle with the leaves from several sprigs of thyme. Roast 25 minutes until tender. Immediately out of the oven, slice any of the larger carrots in half lengthwise. Meanwhile, place quinoa in a bowl and add water to soak for a few minutes. Drain using a fine-mesh sieve, rinse with fresh water and drain thoroughly. Heat a saute pan over medium-low heat and add the wet quinoa. Stir with a wooden spoon until quinoa dries–it will pop, begin to brown and smell nutty. Remove from the heat and let cool. To create the dressing, squeeze juice from half a lemon and half a blood orange into a bowl. Whisk in 1-2 tablespoons of olive oil to taste. Season with salt and pepper. 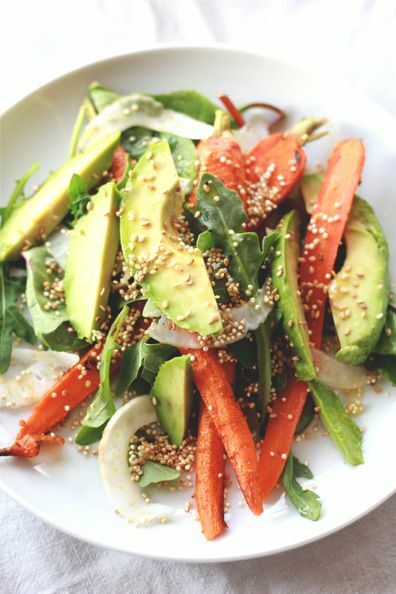 Place a handful of greens on two plates, top with the roasted carrots, fennel, avocado and blood orange slices, and sprinkle with the toasted quinoa and seeds. Drizzle with the citrus dressing and serve with Maldon sea salt flakes. » Roasted Butternut Squash and Red Pepper Soup.